Expanding Your Horizons is an annual conference aimed to interest girls, aged 11 to 16, in science, math, and engineering. Participants attend talks, participate in hands-on workshops, and meet with women scientists and engineers. Group activities are designed to introduce the participants to other like-minded girls who are considering careers in science. 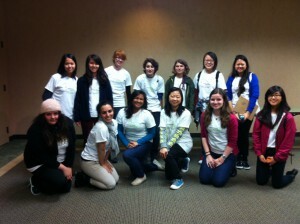 Debby Tran and Melisa Tallis served as mentors at this year’s conference. Fellow UWIP members, Melisa Tallis and Debby Tran, posing with the ACSSA club from UCSD at this year’s Expand Your Horizon’s Conference which was held at USD. Nothing from April 22, 2019 to April 29, 2019.